We commissioned this book to enable lot owners to follow through on their desire to implement self-management. Recently updated in 2018 by one of our own directors, this book is focused on self-management for existing residential or commercial bodies corporate comprising from three lots up to about ten lots. It is not intended to address bodies corporate where there is accommodation and letting; resident managers; body corporate lessees; or bodies corporate with substantial number of lots. 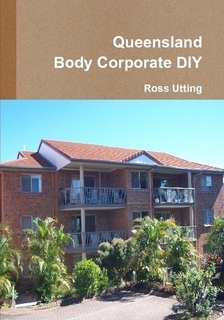 In this book, practical advice is given for the secretary; treasurer; and other committee members to implement systems and processes to support body corporate tasks. It does assume that the reader has basic knowledge of the duties and responsibilities of committee members and an understanding of the general principles regarding bodies corporate in Queensland. Information regarding these matters is freely available and well set out on the Queensland Government body corporate and community management website. You can purchase the book here (Postage to addresses in Australia is inclusive). You can also expect to find it in Brisbane libraries. Buy it for your body corporate! Buy the book and keep the receipt! Request your committee to authorise the expenditure and get reimbursed. Circulate the book to all committee members and lot owners.